One of the oldest and largest student theatrical groups in the country, Carnegie Mellon's Scotch'n'Soda boasts 150 active members from seven colleges and 30 majors. Tackling five to seven shows a year can seem like a full-time job. But you'd be hard pressed to find a group member who doesn't consider it a labor of love. "We're a social organization that just happens to do theater," said Alex DiClaudio (TPR'09, HNZ'11). The group operates mainly out of the basement in the University Center — in what they affectionately refer to as 'the Dungeon.' It's where you'll find everything from chemists learning carpentry to electrical engineers designing pyrotechnics. "Scotch'n'Soda exemplifies the interdisciplinary nature of Carnegie Mellon," explained Shannon Deep (CMU'10, HNZ'11). "Business and accounting majors arrange finances and produce. Mechanical engineers build and design sets. We even have historians and linguists acting as dramaturges." And they rehearse wherever they can, said Todd Snider (HS'10). "An empty classroom? A hallway? Everything is fair game," he said. Snider says that being part of Scotch'n'Soda fosters invaluable skills for business, service, leadership, collaboration and compromise. DiClaudio enjoys seeing the way so many working relationships turn into personal connections, which turn into close friendships. 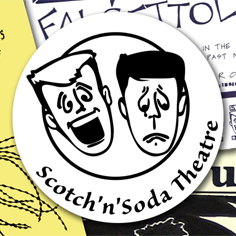 Famous Scotch'n'Soda alumni include composer Stephen Schwartz; director Franklin Heller (What's My Line? ); actor and comedian Frank Gorshin (The Ed Sullivan Show, The Tonight Show, Batman); author Iris Rainer Dart (Beaches); and producer/television screenwriter Javier Grilko-Marxuach (Lost). "We do it because we love it," added Deep. "At the end we're all hugging and kissing and crying. It's kind of like giving birth — you forget the pain. Or so I'm told," she mused.